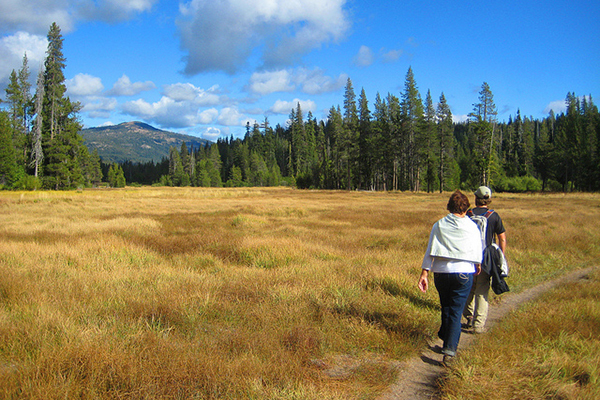 Experience Lassen's second largest hydrothermal via a lovely hike through Warner Valley meadows and forest. Along with a number of other hikes, the trail begins at the Warner Valley trailhead. The first 0.4 mile passes through a meadow over small footbridges and boardwalks before crossing Hot Springs Creek. At the first intersection, go right to continue to Devil's Kitchen. Again, a series of footbridges and boardwalks help hikers navigate through marsh and woodlands to the intersection for Dream Lake at 0.6 mile. Go right again and continue towards the meadow. Here the trail then follows Hot Springs Creek before climbing through forest and on into woodland. At the third intersection, turn right for the last 0.9 mile to Devil's Kitchen. A series of rises and dips takes the trail through two seasonal stream crossings before the trail rises a last time to the rim of Devil's Kitchen. Continue the last 0.2 mile downhill to a bridge the crosses milky Hot Springs Creek. Here a loop trail leads hikers through the sense-reviving boiling mudpots, steam vents and boiling springs. Wander among the crackled yellow and red mounds of the kitchen where steam whirls from fiery cracks in the ground, sounds of plopping, hissing and belching fill your ears and the smell of "something" cooking lingers in the air. The Warner Valley trailhead parking area is located 16 miles northwest of Chester on the Warner Valley Road. From Chester, follow the Feather River Road north 1 mile to a fork for Juniper Lake and Warner Valley. Continue towards Warner Valley/Drakesbad for 15 miles. Bear left onto the dirt road and continue past the Warner Valley Campground to the turnoff for the trailhead.